Orvelte (Dutch pronunciation: [ˈɔrvɛltə]) is a village in the Dutch province of Drenthe. 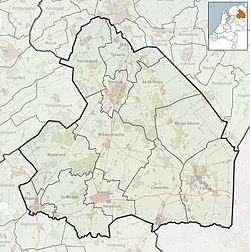 It is a part of the municipality of Midden-Drenthe, and lies about 18 km northeast of Hoogeveen. Less than 100 people live in the village. Orvelte presents itself as a museum village. There is a saw mill, a blacksmith and a wooden shoe maker, all open to the public. A number of events are held throughout the year featuring traditional Dutch activities. The statistical area "Orvelte", which can also include the surrounding countryside, has a population of around 220. ^ Statistics Netherlands (CBS), Statline: Kerncijfers wijken en buurten 2003-2005 Archived 2006-07-24 at WebCite. As of 1 January 2005. This page was last edited on 9 August 2017, at 20:06 (UTC).